Brooke Bound: Brooke, or "Ariel", Our Rising Star! Brooke, or "Ariel", Our Rising Star! If there's one thing you should know about the Toering clan....it's that Chick-fil-a is one of our all time favorite restaurants. Not just because the chicken nuggets, waffle fries, and lemonade just can't be beat, but because all summer long they hold fun, fabulous activities for the kiddos! This last week, they had a "Chick-fil-a Open Mic Night"! It was too cute! Brooke was immediately asking to sing...so she dutifully waited her turn, and then bravely stepped up to the mic for her chance to sing! Her song of choice? "Part of Your World" from the Little Mermaid. Now, anyone who knows Brooke knows that she lives and breathes Ariel. When she goes swimming, you better not slip up and call her "Brooke". She is ARIEL or "mermaid" under NO uncertain terms. 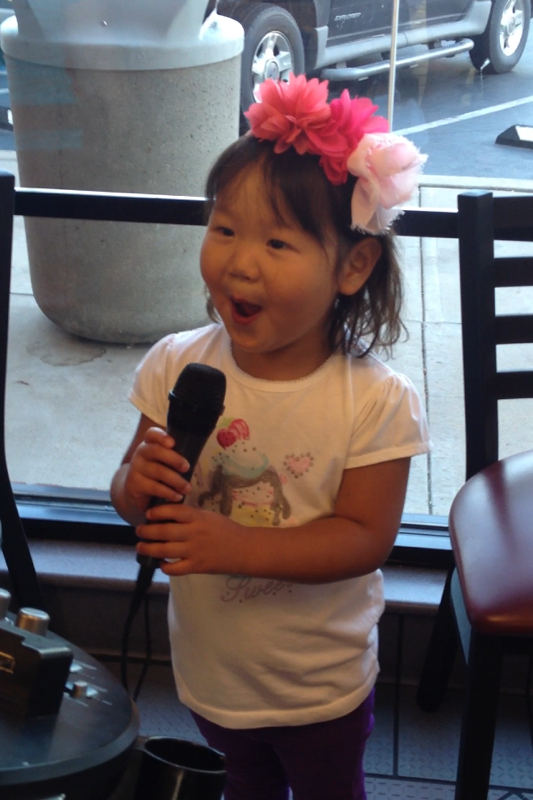 Watching her sing her heart out as "Ariel" at the open mic night was just about too cute to stand. Linking up with Stefanie's Sunday Snapshot! She is so darling! We love Chick fil A too and my children will not even touch McD's anymore! Us as well! As soon as we learned about the "turn in your kids meal book and get a free ice cream cone" deal at Chick fil A...we were SOLD!! Thanks for stopping by! Thanks so much! Glad you could stop by! Thanks so much! She keeps us laughing!! Thanks for stopping by! Yep, that is the most adorable Brooke ever! Oooops, I mean Ariel! The cheeks and bows throw me over the top! Thank you, Nancy! We have all enjoyed following your blog and your seeing your beautiful pictures of your kiddos! I think Brooke and Tess would be great spunky little friends!